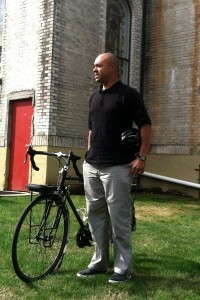 Mychal Tetteh showed up to work on Monday morning ready for his new role as our Chief Executive Officer. 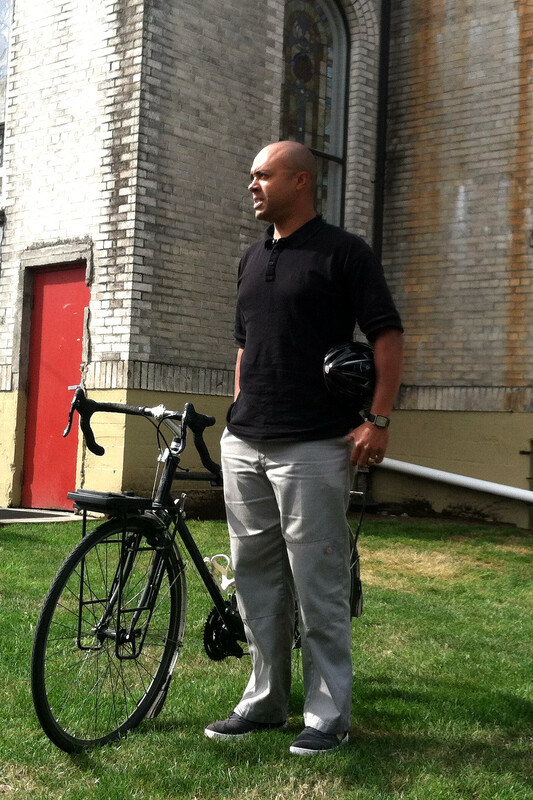 We sat down with Mychal to find out about his plans for the future of the Community Cycling Center and what he learned while working at the Village Market in New Columbia. We discovered some fun facts about his life along the way. First of all, welcome back. What does it mean to be coming back to the Community Cycling Center? How does it feel to lead an organization where you previously worked? I love the Community Cycling Center. When I first started in 2005, I was only qualified to sell inner-tubes. I was inspired by the opportunity the Cycling Center afforded to people from all walks of life. The Community Cycling Center is a great place to work. You can live your ideals and serve the community all while riding bikes. It doesn’t get much better than that. It’s a great honor to work here. I even remember when staff first found out that I got the job, I started receiving text messages. That’s when I really started to feel a sense of responsibility. I want to make sure that all the people who are invested in the Cycling Center—the volunteers that contribute their time, the communities that we’re partnering with, our supporters, and everyone that comes through the door of our bike shop—feel and know that the Center is doing the best that we can to deliver its mission day in and day out. I am committed to the pursuit of excellence in everything that we do. I want us to find ways to deliver our mission in increasingly sustainable and innovative ways in the future. Along with that, I see all of the potential that the Cycling Center has that is currently unrealized. Because I worked here and then left for two years and did something totally different with a different organization, I was able to gain perspective that I didn’t have when I was originally working here. This helped me grasp all of the opportunity that we have at the Cycling Center. It feels good to be back. How will your experience at New Columbia’s Village Market inform your new role here at the Center? I feel like I know everybody out there at New Columbia. The great thing about working at a corner store in a neighborhood like New Columbia is you get a chance to see just about everybody. I had a window on the neighborhood everyday and I spent a fair amount of time at the cash register. It afforded me an opportunity to really know people intimately and get an opportunity to see what they are doing day in and day out and learn more about them and their family, the way they see the world. It was really a privilege to see things at that level, but I also had an opportunity to see what else was missing. After taking care of basic needs like food, clothes, and shelter, you realize there is a whole other hierarchy of needs that exists for people suffering disproportionately from a lack of abundance and you can begin to understand some of the other institutions that need to be in place in order for people to be successful, to be cared for, to be heard, and to be engaged in their community. As Portlanders we’re just starting to scratch the surface of that. New Columbia is the largest affordable housing campus in the country. With the right investments and the right thinking, I’m sure that it can be one of the best places to live anywhere and we can break the cycle of poverty. It’s a matter of how much talent, time, and resources can we leverage in order to get there. I am really excited to share the story of the Community Cycling Center with people that might not know what we do or why we do it. My previous job at the Cycling Center was very internal. My job at the Village Market was very internal. I haven’t really had the opportunity to work outside the institution. I’m really excited about getting out. It’s a wonderful story to tell. I am excited to see our workforce development program get running. It’s right at the core of what we can do to help broaden access to bicycling and the cycling industry, while at the same time it lines up really well with what we are currently doing in our bike shop – creating a really approachable and welcoming environment. How can we strengthen our role in our community? What opportunities do you see for the Community Cycling Center in the future? First, as an organization we have to be very clear about our values. Then we have to find and understand where there is value alignment with the communities, the individuals, and the institutions that we’re trying to work with. Once we’re clear about what we can offer, what our community partners can offer, and where we can go together, then we’ll be able to be in a position to co-create something great. Being able to have really honest and authentic conversations is something we need to do a better job of. We also need to create a greater shared understanding of our role within a broader framework of organized communities. The Community Cycling Center can play a unique role in convening, collaborating, storytelling, advocating, and shaping the conversation around people who ride bikes. The extent to which we are able to shed light and share what we’ve learned as we learn it will be of great benefit and value to bicycling advocacy organizations and to the bicycling industry here in Portland. I ride bikes, I listen to podcasts – On The Media is the best podcast because it gives you a week-long rundown of news coverage. They pull some of the biggest stories and help decipher and analyze the way the news was covered. So, you’re not just getting the news, but they’re analyzing how the media covers events, which I think is pretty interesting. I don’t like to follow mainstream news on a regular basis. So this podcast lets me know the most important things that happened during the week and how they were covered. Tell us some fun facts about your life. Give us the scoop. My second bike was a Diamondback Formula 1, 20” wheels, 10 speeds, with flat, mountain-style handlebars. It was the fastest bike on the block, for sure. My brother, David, left home when he was 17 to be a bicycle messenger in San Francisco and he came back and gave me that bike. When he came back, we were up on Mt. Tabor and he was doing trial moves—hopping the bike up and down off of a picnic table—and I thought that was the coolest thing I had ever seen. I was into bikes before that moment, but I was totally into bikes after that. My dad used to drag me to the top of Mt. Tabor after school on a regular basis. He’d ride and I’d ride right behind him and I’d cry. We would go up Tabor and we’d ride down, and we’d go up and we’d ride down. He would tell me life was hard on the way up and that you might find a point in life when you’ve found success that you can coast back down. Life lessons on Mt. Tabor. I stopped crying after a week or so. I was a Forestry Major in college. I was born and raised here in Portland Oregon. I went to Metropolitan Learning Center K-8 and graduated from Benson Polytechnic High School in 2000. I split time between SE 47th and Belmont, NE 23rd and Alberta, and NW 23rd Avenue as a child. Both of my parents were independently employed entrepreneurs and I spent most of my time outside of school working with them. My dad moved out of a space on 24th and Alberta Street in the Rexall Drugs building and Brian Lacy moved into the same space when he started the Community Cycling Center in the 90s. That’s a fun fact. Do you have a question or comment for Mychal? Feel free to leave it in the comments section below.